The SanDisk slotMusic player looks really cool. You can add different skins to it, and it’s extremely small and cheap. For about $20, you can quickly add music to your player via a microSD card slot instead of transferring music from your computer to your device. But, is this really a problem, and is the slotMusic player really a solution? Well, this SanDisk Sansa slotMusic Player review examines the pros and cons of this player. It wasn’t a joke that the player is small. It’s about the size of a lighter, meaning that you take it nearly anywhere and store it in even the smallest jeans pocket. The size, however, doesn’t translate into a lightweight player. That’s due to the fact that it runs on AAA batteries, which is also a problem with this player. Unlike traditional players, this player doesn’t use any type of lithium ion battery. You can use rechargeable AAA batteries, but battery life only lasts as long as standard batteries. It lasts about 15 hours, but you may find yourself charging it more often. The size of the player is 2.7 inches wide by 1.4 inches high by 0.6 inches deep. It accepts microSD cards up to 16 GB in size. The batteries are hidden behind a removable faceplate. The slotMusic player works similar to a CD player. You download your music to the microSD card. You can also download items like album artwork, videos and liner notes. You stick the card into the memory slot, and then the player plays everything in order, including the order of the albums and the order of the songs on the album. This means that you can’t shuffle songs and are restricted to the traditional format of CDs. The sound of this player is pretty good. It’s definitely not the same as more expensive players, including the Sansa Fuze and Apple iPod. But, for a budget player, it’s pretty decent. You will, however, want to invest in better earphones. The ones that come with the player lack quality. The slotMusic player supports MP3 and WMA music. The player has no moving parts, making it very easy. This player is really designed to the beginner user in mind, and it’s perfect for parents or grandparents who want to play their music. 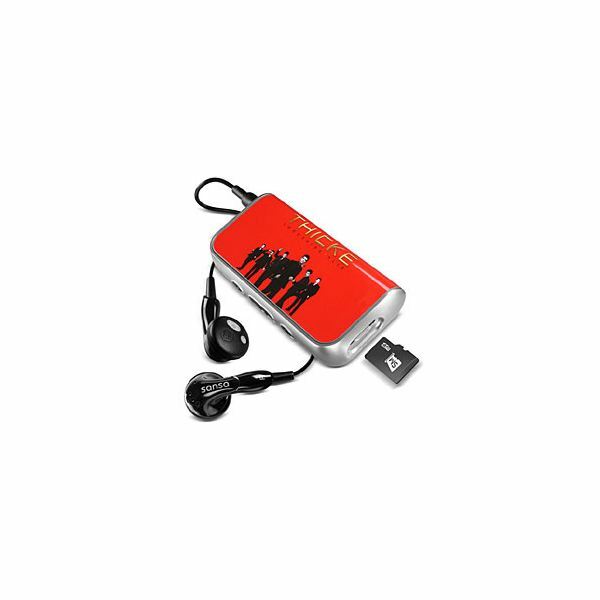 This MP3 player doesn’t even come with a USB cord because you don’t need it. You don’t sync the device. Instead, you transfer the media directly to the microSD card. Another problem with this player is keeping track of the memory cards. MicroSD cards are extremely small, and they’re easy to misplace. So, you should keep them in a case specifically designed to carry these types of cards. You can buy albums already designed for the slotMusic player, but you’re looking at paying the same price as a traditional CD. This is a costly investment. Further, the player doesn’t have any internal memory. Overall, this SanDisk Sansa slotMusic player review indicates that the player is pretty capable despite its inexpensive price. More advanced media player users probably won’t be interested in this device because you can’t shuffle music. It also doesn’t have internal memory. But, beginner users will find it very easy to use, and you don’t need a computer to transfer music. Despite a few quibbles, this budget player is definitely worth checking out. Just remember to always keep your memory cards together and in a safe place.